The last night ride of the season as it were took place a few weeks ago in the middle of October. 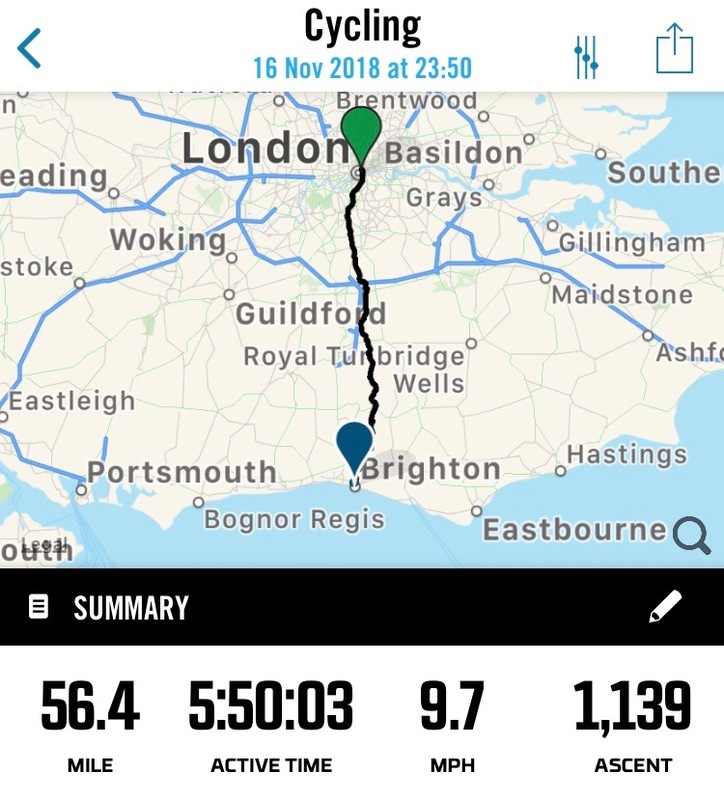 With some mild weather predicted during the week commencing 12th November, I asked a few friends whether they might be interested in a London to Brighton overnight ride on Friday, 16th November into Saturday, 17th November. Only Dr John was able to make it, so for the third time this year, we embarked on another overnight ride to the coast. 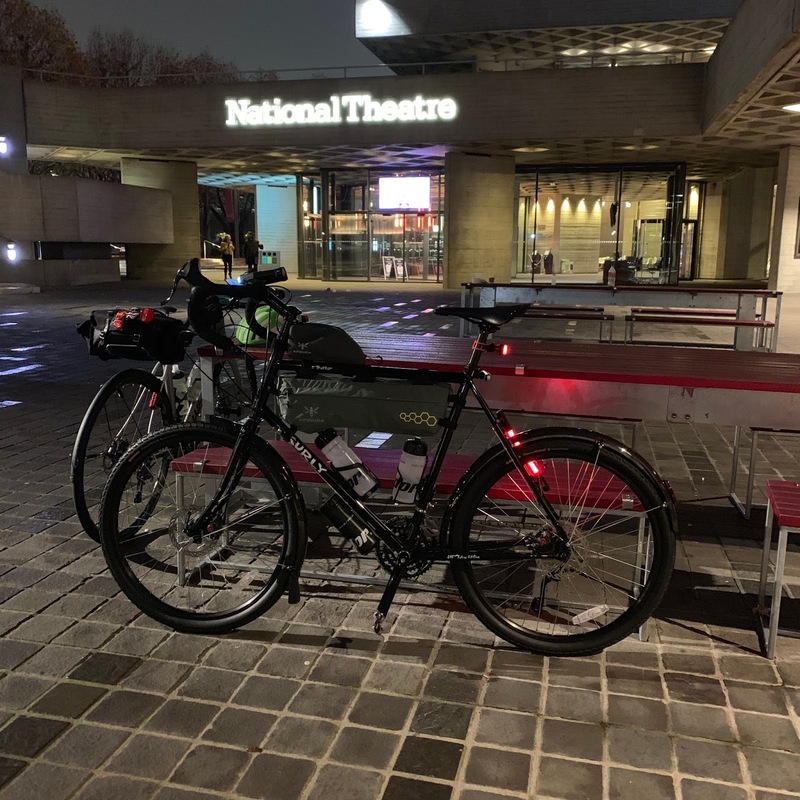 The meeting point was the near the National Theatre at around 23:30. I made the short cycle ride from Barbican where I had earlier stopped off to see an old friend who lives there. Dr John was there already and instead of waiting until midnight, we decided to set off about ten minutes earlier. This was mainly as the weather was changeable. It was misty and at times in out front lights it appeared as if it was raining. This was dampness in the air and this hazy/mist would continue for the rest of the night and early morning. I know that Dr John would be taking one of his road bikes and I decided to stick with the tried and tested comfort of my Surly Disc Trucker, rather than my Brompton. 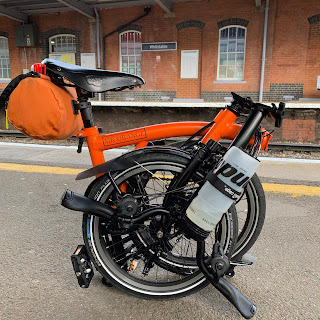 I packed as light as I dared and used my Apidura Frame bag to carry the basic essentials - namely food. 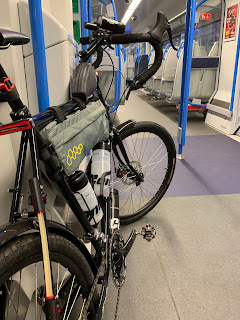 Like those polar expeditions you sometimes ready about, our London to Brighton overnighter was totally unaided and as such we had to take what we needed with us. The route was the same one we had done twice before and it was a very good one. For some reason the roads seemed slightly quieter than usual which made for very pleasant cycling. The beauty of this route is that by the time you reach the outskirts of Clapham Common, things become even quieter and the urban is quickly left behind. Riding over a cattle grid signalled a little hill the top of which had good views of the stars and the urban landscape below. This time no cows were seen in the adjacent green areas. Dr John and I talked about all sorts as we cycled and as always he was excellent company. The miles flew by and quite unexpectedly we arrived at our halfway stop. This was at a Scout Hut in Burstow - or should I say by the fence outside the Scout Hut in Burstow! After eating the food we had brought with us we decided to get going again as both of us were feeling cold. Putting on a neck-warmer (which really did make all the difference) we cycled off and after a few miles felt okay again. Roughly 8 miles after the halfway stop we approached 'Turners Hill.' Dr John was off into the distance and I followed. This had been the location where we stopped, sat on a bench and I nodded off. This time we kept moving and cycled on. 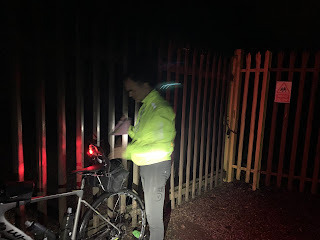 We made very good progress and didn't feel the need to cycle particularly fast, preferring to chat, spot all manner of creatures running, flying and crying out. The miles came very easily and Ditchling Beacon was upon us. Dr John was soon off into the distance and I followed. My Surly has some great gears that really do make climbing very steep hills easier but much slower naturally. At the top I put it to Dr John that I might be slower going up hills on my Surly than my other bikes. Dr John speculated as to why I had only just realised this! The top of the Beacon was lovely at this time of the day. 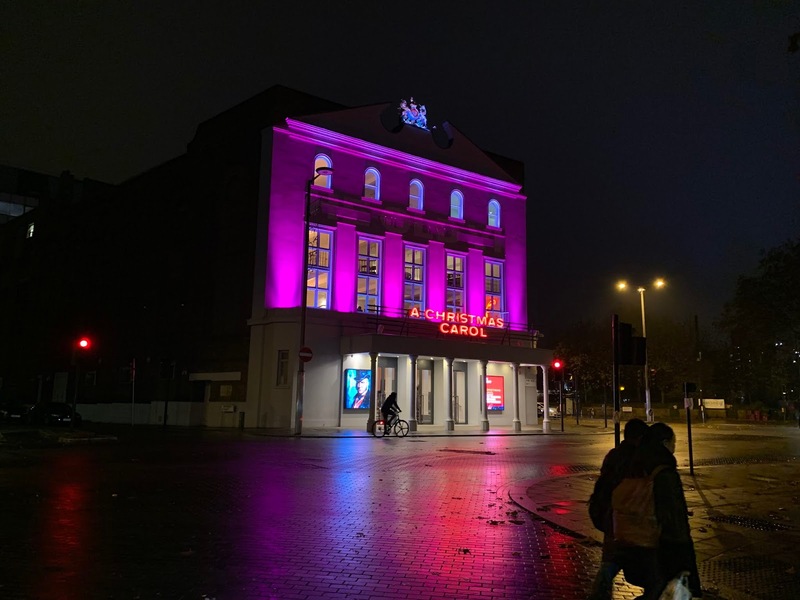 It must have been just before 06:00 and it was still dark. The last few miles into Brighton were wonderful. Much of it was downhill and we enjoyed every last mile. We decided to head straight for the station as nothing would be open and there didn't seem like much point hanging around. We got some food from a stall inside the station and made our way to the trains. We took different trains that more or less set off at the same time. A few stops went by and I saw Dr John about to board my train. There was engineering works on part of his line which meant he had to get home via a different route. We got off at Blackfriars and cycled along embankment, across the Thames and boarded the tube. After a few stops we said our goodbyes. 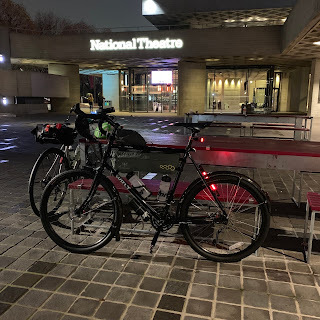 This was a lovely adventure and I don't think I will ever get tired of the route or the simple pleasure that is nocturnal cycling through the night. Many thanks to Dr John for agreeing to come along. 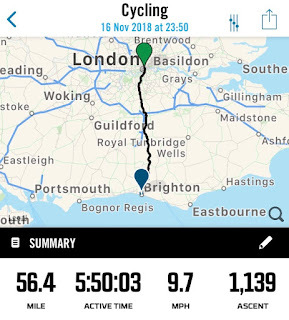 I would say that this is definitely going to be the last night ride to the coast this year but I think that there might be room for just one more - assuming I can convince Dr John to do this all again!